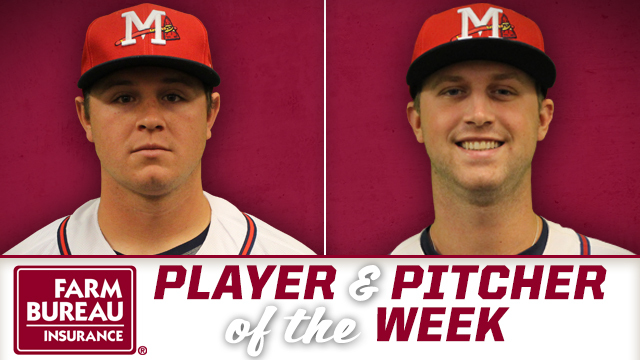 PEARL, MS -- Infielder Jacob Schrader and RHP Max Povse have been named Mississippi Farm Bureau Player and Pitcher of the Week for the week ending Sunday, August 21. Schrader, 25, posted a .333 batting average in six games during the week. He had a double, two home runs and three RBI. For the M-Braves this season, Schrader is hitting .236 with 16 doubles, 12 homers and 38 RBI through 98 contests. He was selected as a Carolina League Post-Season All-Star last season after hitting .268 with 28 doubles, three triples, 15 home runs and 59 RBI. Schrader led all Braves farmhands in homers (15) while ranking second in doubles (28) and fifth in RBI (59) last year. The Florida native was selected by the Braves in the 27th round of the 2013 draft out of the University of Tampa. Povse, 22, tossed eight two-hit shutout innings against the Pensacola Blue Wahoos Saturday night at Trustmark Park. The right-hander threw just 89 pitches over that span, walking one and striking out five. Since joining the Double-A Braves on July 9, Povse has posted a 4-0 record with a 2.45 ERA in eight starts. He was 5-5 with a 3.71 ERA in 15 starts for the Mudcats before joining Mississippi. He posted his best numbers during the month of April when he went 2-1 with a 1.69 ERA in four starts. A native of North Carolina, Povse was selected by the Braves in the third round of the 2014 draft out of UNC Greensboro.